"57 As evening approached, there came a rich man from Arimathea, named Joseph, who had himself become a disciple of Jesus. 58 Going to Pilate, he asked for Jesus' body, and Pilate ordered that it be given to him. 59 Joseph took the body, wrapped it in a clean linen cloth, 60 and placed it in his own new tomb that he had cut out of the rock. 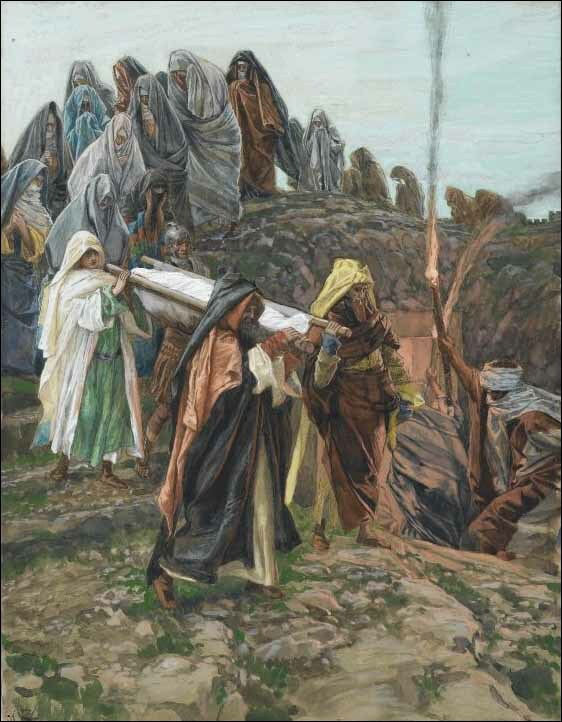 He rolled a big stone in front of the entrance to the tomb and went away. 61 Mary Magdalene and the other Mary were sitting there opposite the tomb." "53 Then he took it down, wrapped it in linen cloth and placed it in a tomb cut in the rock, one in which no one had yet been laid. 54 It was Preparation Day, and the Sabbath was about to begin."